Almond Flour Pancakes are the perfect way to kick start your day. 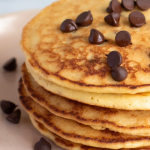 This keto pancakes recipe will fuel your body, not your waistline! 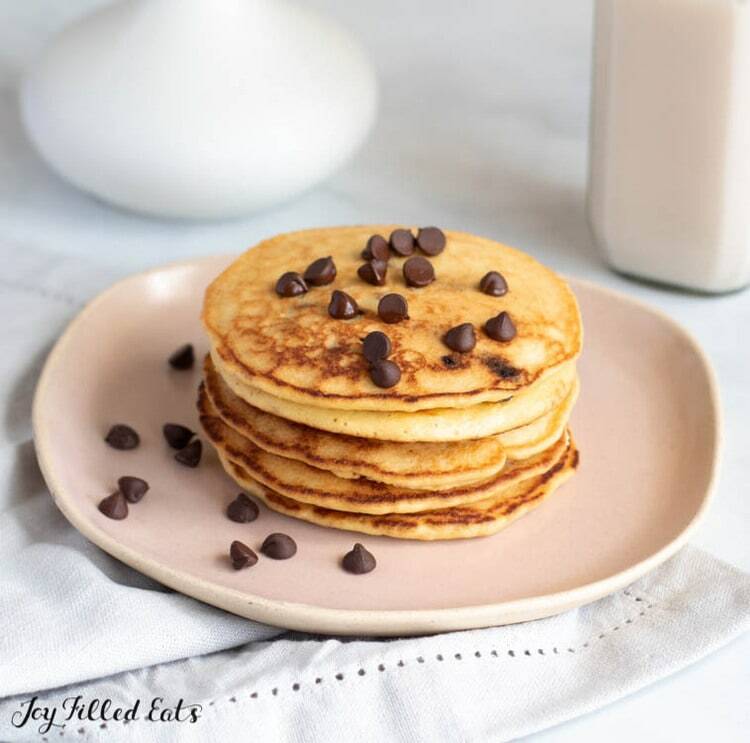 Light and fluffy dairy-free pancakes made with blanched almond flour, almond milk and a sprinkle of sugar-free chocolate chips! Pancakes are a weakness to me. There is something about a stack of pancakes that just instantly makes a day better. Right? Well, I wanted to create a lower carb pancake that would keep me on track following the keto diet. This almond flour pancake recipe won me over. I mean you can’t go wrong with chocolate chip pancakes that don’t make you feel guilty afterward. 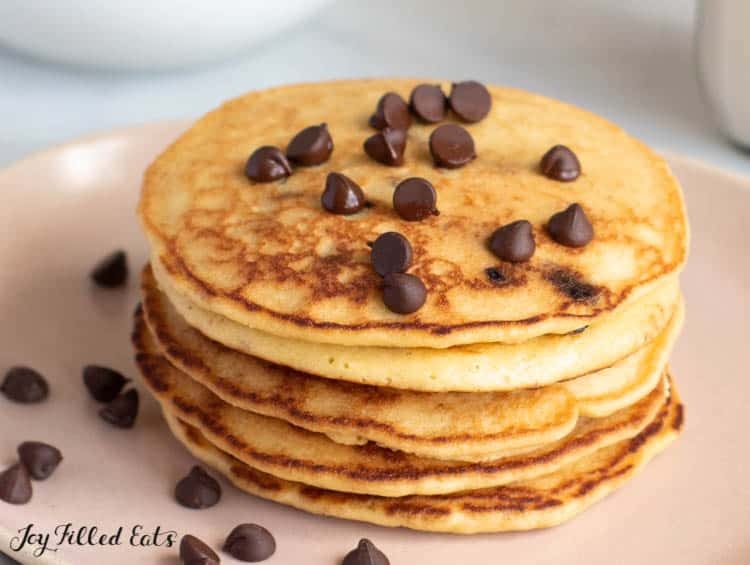 Give these dairy-free pancakes with chocolate chips recipe a try today, and see how you like it! It was an instant winning recipe for my family, and they can be a little picky on what pancakes they say are tasty. I think the chocolate chips help to win over a crowd, cause who can resist. Making pancakes with almond flour is almost the same as making regular pancakes. You just use a different brand of flour. 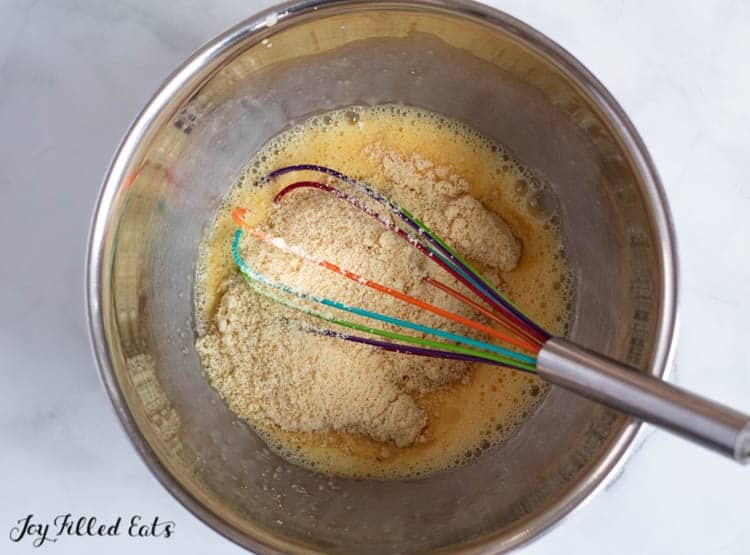 Almond flour, baking powder, stevia, salt, eggs, and almond milk get blended together for a smooth batter. Then stir in your sugar-free chocolate chips, and start cooking them on your griddle or frying pan! You are welcome to create a dry pancake mix that you save for later to use. Then mix in the wet ingredients and stir, and then fold in the chocolate chips. 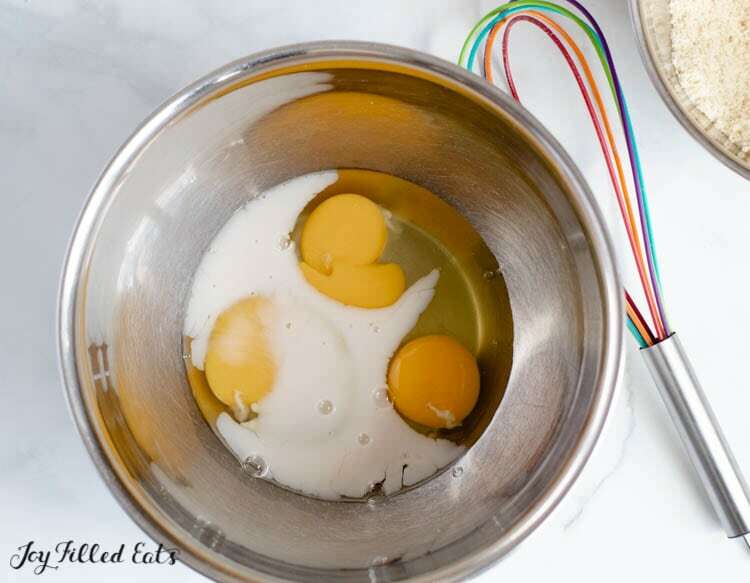 This works great and will save you a little prep time when you go to mix up your pancakes. Just do all your dry ingredients, and then write down what amounts of wet ingredients to add on the bag, and store in a sealed bag or container! Of course. You can use other milk replacements or regular milk in replace of the unsweetened almond milk. Just note that it will change the nutritional values depending on what milk or milk replacement you reach for. Start by mixing your flour, baking powder, stevia, and salt together. Then add in your eggs and almond milk and give it a good whisk. You want to try and work out the lumps in your batter. Once it is nice and creamy, add in your chocolate chips and fold it in. Then let your batter sit for about four minutes to help thicken it. On a greased griddle or pan, pour batter out, and cook both sides. Serve nice and hot! 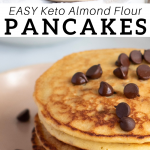 Have you ever tried almond flour pancakes before? Yes! These pancakes freeze beautifully! I like to save back extra pancakes and freeze them so I have a leisurely weekday breakfast I can heat up when I don’t have time to make these pancakes from scratch. 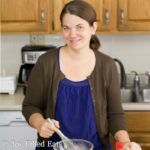 What I do is place a piece of parchment paper or wax paper in between each pancake and then place them in an airtight container or freezer bag. Then toss them into the freezer until I am ready to serve them up. If you froze your pancakes, just place them in an oven at 350 degrees and heat until they are warmed through. Or toss them in a microwave with a cup of water. The water will help keep the pancakes nice and moist as it heats it up. Like all pancakes, they are best when served warm. But, you can easily store leftover pancakes in the fridge for later. Eat them cold or warm them back up in the oven or microwave. They will change slightly in texture, but the taste will be the same. I hope you all enjoy this tasty keto pancakes recipe. We have been making this recipe over and over again, and each time it turns out incredible. Serve with a side of turkey bacon, sausage, or bowl of fruit. These pancakes will win over a crowd. 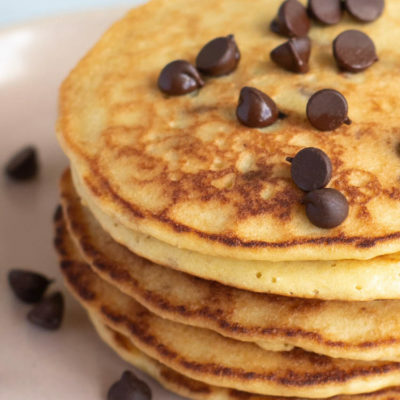 Almond Flour Pancakes with Chocolate Chips are the perfect way to start your day. These light & fluffy keto pancakes recipe will fuel your body all morning! 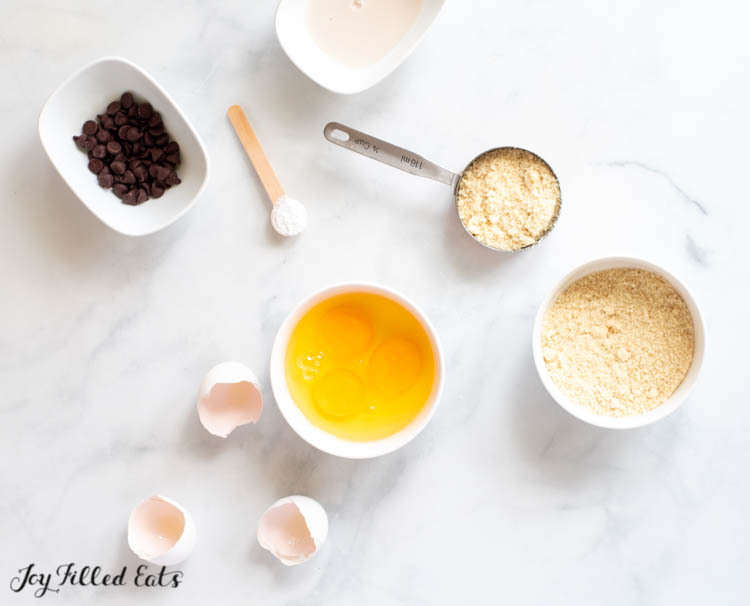 In a medium bowl add the dry ingredients (almond flour, baking powder, stevia, and salt) whisk until all the ingredients are well combined. 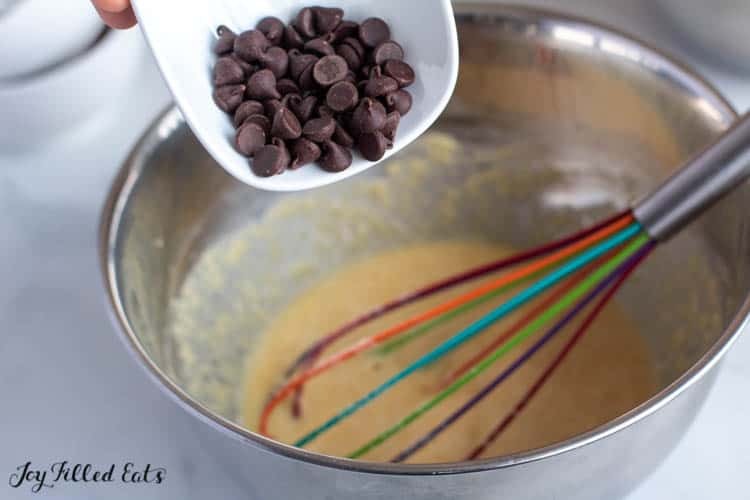 In a separate bowl add the eggs and almond milk, whisk with the whisker for one minute until you have a creamy and liquid batter, add the dry ingredients to the wet and continue whisking for another 30 seconds, at this point add the chocolate chips and stir them into the batter. Let the batter sit for 4 minutes to thicken. Heat a lightly oiled griddle or frying pan over medium-high heat. Pour or scoop the batter onto the griddle, using approximately 1/3 cup for each pancake. Brown on both sides and serve hot. 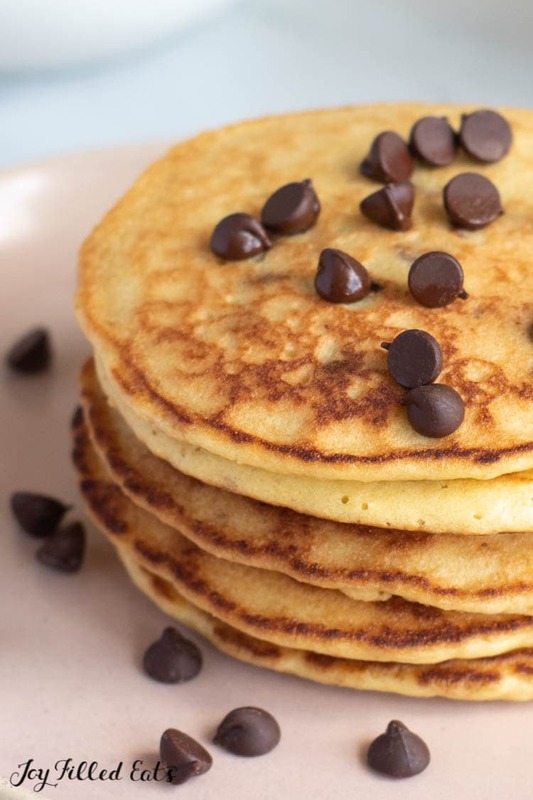 Without sugar-free chocolate chips, each pancake has 4 total carbs and 1 gram of fiber. They each have 3 net carbs. I love healthy & tasty ways to start my day! These pancakes are going to be a huge hit in my home! Can't wait to try this recipe, I know my family will love it!